1791 ~ 1830: born in Ôsaka. He is the son of the playwright Dekishima Sensuke. He starts his career as a disciple of the actor Ôtani Tomoemon II, who gives him the name of Ôtani Fukuzô and trains him in the Kamigata theaters. He takes the names of Ôtani Mansaku and Ôtani Rakuen at unknown dates. 1830: his master Ôtani Tomoemon II dies. 1831: Ôtani Rakuen settles in Edo. 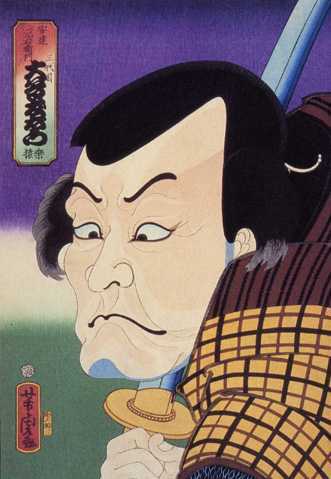 11th lunar month of 1831: Ôtani Rakuen takes the name of Ôtani Tomoemon IV at the Kawarasakiza, playing in the drama "Matsu o Chikara Tomoe no Fujinami". It is interesting to note that 1 month earlier, in 9th lunar month of 1831, the actor Arashi Shagan IV, another disciple of late Ôtani Tomoemon II, took the name of Ôtani Tomoemon III in Ôsaka. The 2 actors play under the same name in 2 different cities (an unique case in Kabuki history). Ôtani Tomoemon IV and Ôtani Tomoemon III are nicknamed respectively "Edo Tomoemon" and "Kamigata Tomoemon". 11th lunar month of 1834: Tomoemon plays at the Moritaza 3 roles in the drama "Hana to Mitsu Yuki no Shiraishi". 7th lunar month of 1835: Tomoemon plays for the first time the role of the villain Motoemon in the drama "Tengajaya-mura", which is staged at the Nakamuraza; his stage partners are Matsumoto Kôshirô V (Tôma Saburôemon), Bandô Hikosaburô IV (Iori, Kôemon) and Ichikawa Kumetarô (Genjirô). 4th lunar month of 1836: premiere at the Moritaza of the drama "Hakkenden Uwasa no Takadono"; Tomoemon plays the roles of Makuwari Taiki Tsunetake, the shôya Hikiroku and Konaya Bungobei [casting]. 11th lunar month of 1839: Ôtani Tomoemon III dies in Ôsaka. 1842: Tomoemon goes back to Kamigata. 5th lunar month of 1843: Tomoemon plays at the Kado no Shibai the role of Motoemon in the drama "Tengajaya-mura", which is produced by the zamoto Onoe Waichi; his stage partners are Onoe Tamizô II (Tôma Saburôemon, Kôemon and Iori) and Nakamura Kashichi III (Genjirô). 7th lunar month of 1843: Tomoemon plays at the Minamigawa no Shibai (Kyôto) the roles of Tôma Saburôemon and Motoemon in the drama "Tengajaya-mura"; His stage partners are Onoe Tamizô II (Kôemon, Iori) and Onoe Umezô (Genjirô). 1st lunar month of 1845: Tomoemon is back in Edo; he plays at the Kawarasakiza in the drama "Sakigake Genji Soga no Tehajime", which celebrates the shûmei of Ichikawa Shinsha I. 4th lunar month of 1848: Tomoemon plays at the Kawarasakiza the role of Motoemon in the 9 acts drama "Tengajaya-mura"; his stage partners are Bandô Hikosaburô IV (Iori, Kôemon), Bandô Takesaburô I (Genjirô), Matsumoto Kinshô (Tôma Saburôemon, Mansuke, Yasuke) and Onoe Baikô IV (Somenoi). 2nd lunar month of 1851: premiere at the Ichimuraza of Sakurada Jisuke III's Kiyomoto-based dance "Akegarasu Hana no Nureginu", commonly called "Urazato Tokijirô"; Tomoemon plays the role of Yamanaya Shirobê [casting]. 1st lunar month of 1852: premiere at the Ichimuraza of Sakurada Jisuke III's drama "Satomi Hakkenden"; Tomoemon plays the roles of the shôya Hikiroku and Konaya Bungobei [casting]. 9th lunar month of 1853: Tomoemon plays at the Ichimuraza the roles of Onoemon and the villain Kyôgoku no Takumi in the drama "Kana Kyôdai Musume no Adauchi" (similar to the famous play "Hikosan Gongen Chikai no Sukedachi"); the roles of Rokusuke and Osono are played by Arashi Kichisaburô III and Nakamura Tomijûrô II. 3rd lunar month of 1854: premiere at the Kawarasakiza of Kawatake Shinshichi II's drama "Miyakodori Nagare no Shiranami"; Tomoemon plays the role of the evil masseur Ushiichi [casting]. 6th lunar month of 1854: Tomoemon plays at the Kawarasakiza the roles of Motoemon and Mansuke in the 7 acts drama "Tengajaya-mura"; His stage partners are Arashi Rikan III (Iori, Kôemon), Bandô Takesaburô I (Genjirô), Ichikawa Kodanji IV (Tôma Saburôemon, Yasuke), Kawarasaki Gonjûrô I (Hazue) and Bandô Shûka I (Somenoi, Otoki). 1857: tour in the provinces of Suruga and Ise with his son Ôtani Tomomatsu. Spring 1859: Tomoemon plays in Nagoya in the precinct of the Seijuin temple. It seems that it is his last stage performance because his name does not appear anymore in theaters banzuke. 1st lunar month of 1861: Tomoemon dies in Ôsaka; his tombstone is located in the cemetery of the Yûkôji temple in the district of Shimoteramachi. Ôtani Tomoemon IV was a Katakiyaku who gained fame thanks to his incredible performance in the role of the villain Motoemon in the drama "Katakiuchi Tengajaya-mura". He was also famous for being quarrelsome when drunk and had troubles with many others actors but became more reasonable from the time his son Ôtani Tomomatsu started to appear on stage. Ôtani Tomoemon IV in the role of Motoemon in the play "Katakiuchi Tengajaya-mura"